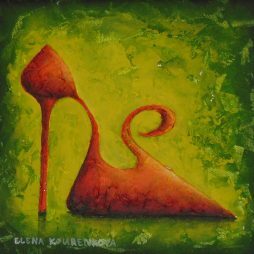 Elena was born in Volgograd, Russia, in 1966. She qualified as an architect and lived and worked in Moscow. She has completed several accomplished projects; she has also worked as a commercial interior designer. In 1996, she moved to Glasgow and began to paint full time. 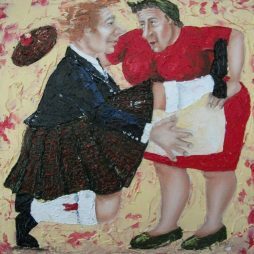 Since then, she has exhibited widely including at the Royal Glasgow Institute, Paisley Art Institute and Aspect Prize exhibition. She is represented by a number of Scottish and British galleries and has work in private and corporate collections in the UK, Australia, Greece, USA, Germany, Spain, Sweden and Russia. Elena has featured in various articles in local and national publications including The Herald, Evening Times, Uptown, Homes &Interiors Scotland, Home Style, Home Plus and N01. 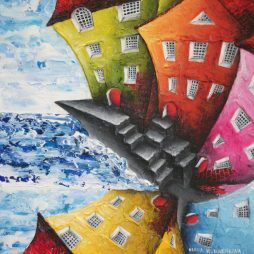 Her work and images have appeared in Channel 4’s ‘Grand Designs’. My characters are always taken from everyday events. Sometimes they might seem emotionally isolated, keeping themselves to themselves – even when they are clustered in groups-but they are not lacking emotions, they only express them in their own way. Some of them present themselves full of self-importance, others just go about their business; some might imply something very absurd and not entirely cheerful in their very idea, but things are not always what they seem…they tell us one thing but we see another… In other words, life as we see it but don’t always notice.